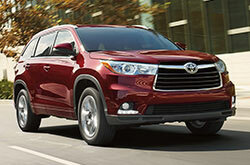 It's the year of MORE for the Toyota Highlander. 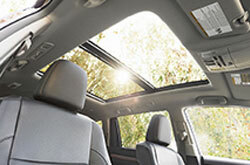 The award-winning seven-passenger SUV ushers in a refreshed look highlighted by a new grille and revised headlights. It also offers a new, more powerful V6 engine and advanced eight-speed automatic that achieve greater fuel efficiency. More models have been added to the lineup as well, giving shoppers additional choices. 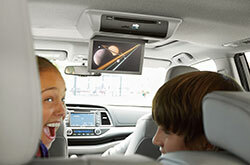 Plus, Toyota's suite of safety and driver-assist technologies is now standard on all trim grades. Considering a 2017 Toyota Highlander in the Dallas Metroplex? 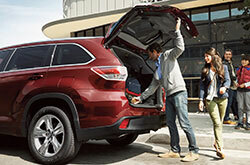 Check out specs for the SUV below, along with inventory listings. Highlander now offers a total of nine trim options: Highlander LE, LE Plus, XLE, all-new SE, Limited, Hybrid LE, Hybrid XLE, Hybrid Limited and Hybrid Limited Platinum. Kelley Blue Book's 2017 Toyota Highlander review says shoppers will like this car if they're looking for a safe SUV with the "strengths of comfort, economy, reliability and resale value." Another strong point is its excellent set of standard features, which includes equipment like five USB ports (with two in second row), remote keyless entry, a rearview camera and Entune multimedia. 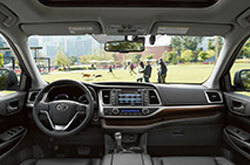 Additionally, when you come see the 2017 Toyota Highlander in Richardson, you'll get to check out its "flexible second row" and "easy third-row access," which Car Connection calls a plus. Three powertrains are available, beginning with the LE's 2.7-liter four-cylinder and six-speed automatic. The model achieves an EPA-estimated 20 city/24 highway mpg, and produces 185 horsepower with the four-cylinder. Next up, 2017 Toyota Highlander reviews have been buzzing about the SUV's new 3.5-liter V6 engine, which produces 295 horsepower and 263 lb.-ft. of torque - an enhancement compared to the previous six-cylinder. Paired with a new eight-speed automatic and stop-start technology (except on LE), models with the V6 achieve an EPA-estimated 20 city/27 highway mpg - ratings that are also up from last year. For even greater power and efficiency, you can buy or lease a Toyota Highlander Hybrid in the Dallas-Fort Worth area and get the power of the V6 and a high-torque electric motor. Together they produce a combined 306 horsepower and 29 mpg combined (30 city/28 highway). Every 2017 Toyota Highlander at our dealership in Richardson comes with Toyota's Star Safety System and Toyota Safety Sense-P, which has been made standard on all trims. TSS-P includes Lane Departure Alert with Steering Assist, a Pre-Collision System with Pedestrian Detection, Dynamic Radar Cruise Control and Automatic High Beams to provide enhanced peace of mind for family SUV buyers. Additionally, the 2017 Highlander Limited gains a standard Bird's Eye View Camera with Perimeter Scan. What's Changed on the 2017 Toyota Highlander? 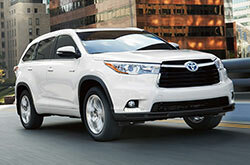 Is the Toyota Highlander a Great Option for You? If you're not sure the 2017 Ford Explorer, Honda Pilot, Chevrolet Traverse, Buick Enclave, Dodge Durango and the GMC Acadia are suitable for you, then check out a 2017 Toyota Highlander near Richardson. It could be a superb match for you, due to its user-friendly in-car technologies and driver-focused personality. Find out if the 2017 Toyota Highlander is perfect for you using our review and other research tools, then browse hot-off-the-press financing and leasing incentives! As a neighborhood Toyota Highlander dealer, we're the location to find up-to-the-minute finance offers on both new and quality used car models. When searching for a car, it's crucial to make a knowledgeable choice; that's why we've included this 2017 Toyota Highlander review the perfect fit on our site. Toyota of Richardson offers a gigantic stockpile of stately Toyota Highlander models in Richardson, TX. Visit us to take one for a spin. Hoping to see its cabin before you visit? Play our video clip to get a glance at its equipment!